The Red Hat Open Innovation Lab opens in London. The first regional Red Hat Open Innovation Lab opened in London this week. It will serve Red Hat clients in the Europe, Middle East and Africa (EMEA) region. 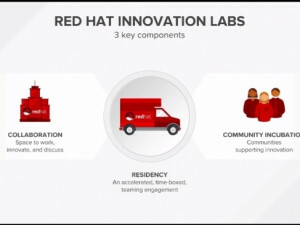 The innovation lab is designed for customers of the open source enterprise support company to work collaboratively in a residency-oriented lab environment with Red Hat experts. The aim is to help these companies quickly solve business challenges and jumpstart their application development with open source technology and DevOps methods. There are two other similar labs, in Boston and Mountain View, both in the US. Firms can either take up a four- to 12-week residency at the physical lab in London, or a pop-up lab can be organised at a company site. "We like to think of the labs as a start-up incubator for the enterprise," says Jeremy Brown, EMEA lab director. Red Hat is not exclusive to, but mainly focuses on, the public sector, financial services and telecommunications industries. EasiER AG, a Swiss digital start-up healthcare company and Red Hat client, is currently using the lab to develop disruptive applications to make medical resources more accessible and enable the medical community to deliver care more efficiently and effectively. "We wanted to release a new application that could disrupt the medical care market and allow patients to request critical services and care from their doctors via mobile," says Dr Andr'e Baumgart, co-founder of easiER AG. He notes the company got distracted from this goal in its day-to-day environment and taking up residency in the lab allowed it to focus solely on the new product. "Red Hat Open Innovation Labs is a focused and intimate team engagement that helps us accelerate innovation ? by providing the people, processes and technologies to help tackle our challenge and make medical care more accessible. It's amazing to work with people you've only just met to build something you've had in your mind for years." Any Red Hat EMEA client, including those in SA, can apply to use the lab. Red Hat has had a local office in SA since 2008. It was reported recently that the company hopes to expand that presence to Kenya and Nigeria in the coming years. Lee Miles, Red Hat CEMEA regional manager, told ITWeb in an interview at the Red Hat Summit earlier this month that it will extend its academic programmes in SA, Kenya and Nigeria, to make sure there is a new generation of developers that are Red Hat certified.